Nobody Mention the (Iraq) War! 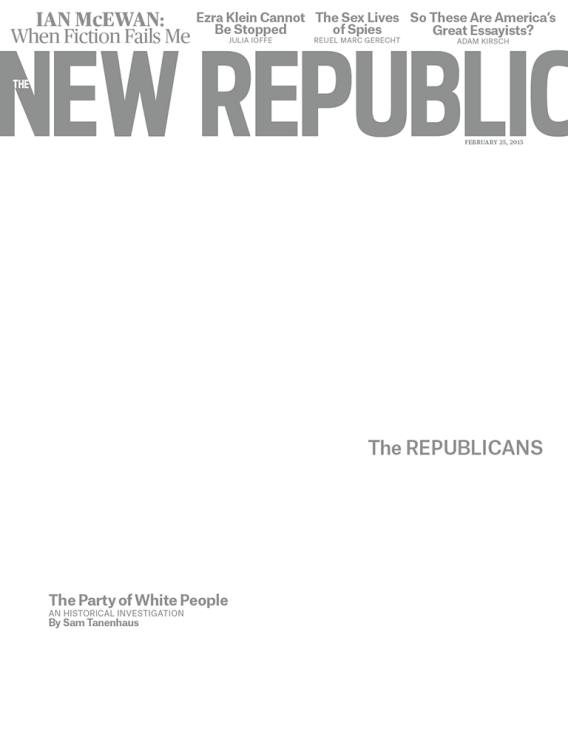 The cover of the February 25, 2013 issue of The New Republic. We were for the Contras in Nicaragua; wary of affirmative action; for military intervention in Bosnia, Rwanda and Darfur; alarmed about the decline of the family. The New Republic was also an early proponent of gay rights. We were neoliberals. We were also Zionists, and it was our defense of the Jewish state that put us outside the comfort zone of modern progressive politics. Really? It was just the “defense of the Jewish state” that did that? Only natural for Peretz to imply that his enemies are anti-Semites, but a better explanation for the magazine’s decline, in his era, was its bending-backwards advocacy for the Iraq War. Its circulation didn’t drop markedly in the 1990s, when the magazine became the liberal outpost of silly-in-retrospect Clinton-hating. No, its circ dropped by 40 percent from 2002 to 2006, when TNR dug in on the Iraq War, endorsed Joe Lieberman in the 2004 Democratic primary, and generally made errors of trust and logic that poor Peter Beinart has spent years atoning for. The word “Iraq” doesn’t make it into the Peretz op-ed at all, which makes sense, because it’s easier to fulminate about how “jeremiads against ‘neoconservatives’” are “fashionable” and thus wrong. He condemns the new TNR for leading with a (very soft and friendly, but newsy) interview with the president because “the magazine wasn’t supposed to be a White House siphon.” But Peretz told The New York Times in 2011 that he clashed with former editor Michael Kelly over Kelly’s Savonarola coverage of Bill Clinton’s scandals—Kelly was “an awful, obsessed man”—and Peretz spent half his tenure promoting the career of almost-president Al Gore, a personal friend. Oh, why bother looking for consistency from Peretz in anything apart from Arab-bashing? My point is that he tries to diagnose why a new editor/owner might take TNR away from some of the positions that the mag had in his day, and totally glides past the magazine’s backing of a trillion-dollar foreign policy disaster.